Power, Jelousy, Love, Madness are the four main issues Nabucco (Nabucodonosor), Giuseppe Verdi's masterpiece, deals with. This powerful opera with the masterly structure is famous for its melodies, such as the chorus Va pensiero. It is staged at Odeon of Herod Atticus (6/9 to 12) by a constellation of world renowned Greek and foreign artists in a grand production that bears the signature of the Greek National Opera. 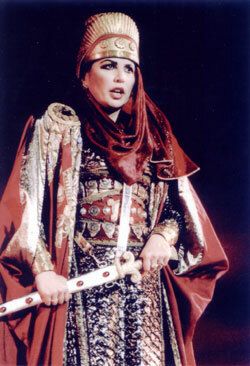 Nabucco was Verdi's breakthrough opera. The libretto was written by Temistocle Solera after the play Nabucodonosor by Anicet-Bourgeois and Francis Cornue. First performed in La Scala, Milan, in March 1842, today the play is still best known for the chorus Va, pensiero (a paraphrase of Psalm 137), sung by the Hebrew slaves as they await their fate at the hands of the Babylonian tyrants. At the time of its first performances, the piece soon became a popular anthem for the Italian people, expressing their own longing for political freedom from Austria. When Verdi's coffin was carried to its final resting place a month after his death in 1901, the crowd of over 25,000 people along the route spontaneously began singing this stirring chorus. The opera is designed by Verdi as a lesson in statecraft, and in the emotional qualities necessary for leadership. Set in Biblical times, in the 6th century B.C., it is the magnificent story of the conquest of the ancient Hebrews and their exile by the waters of �abylon. Nabucco, the king of Babylon, has tremendous power and his cruelty is relentless. But even more dangerous is Abigaille, the child of slaves who stops at nothing to gain the throne. Revenge, retribution and, ultimately, salvation make Nabucco an unforgettable experience. Maria Guleghina - Lucia Mazzaria (Abigaille), Francesco Ellero D’Artegna - Andrea Silvestrelli (Zaccaria), Stamatis Beris - Dimitris Sigalos (Ismaele), Viktoria Maifatova - Marita Paparizou (Fenena) and others.